My birthday is coming up. It's right around the corner actually, on the 1st of May. And although in my family, birthdays aren't special days or particularly celebrated, my twin sister and I were fortunate enough to be born on a major holiday, which meant that whether my parents wanted to celebrate our birthdays or not, there was always a celebration regardless. May 1st is May Day, which is also known as Beltane. In many religions including our family's, this is a religious holiday. What that meant for us is that our parents always had the day off of work and my sister and I always got the day off school. Not only that, but there was usually a party of some kind to go to involving moon cakes, cookies, dancing and a lot of fun activities for kids and adults. This made our birthday special, even if that wasn't the point of the actual celebration. Beltane celebrates the fertility of spring and the greening of the earth and is the last of the three spring festivals, which heralds in the arrival of summer. It's filled with celebrations of fertility including maypole dancing, which is one of the more popular and well known ways off celebrating this special holiday. I've chosen the pictures in today's post from a shop on Etsy that is filled with a wide variety of beautiful jewelry that, to me, celebrates this season to perfection. I especially like the floral pendant necklaces in this shop, which I think are remarkable and perfect for the season. 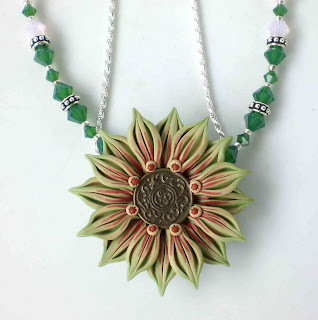 These necklace are made by Magdalene Jewels in collaboration with Zuda Gay, who created the pendant itself. In fact, the artist at Magdalene Jewels will gladly custom design any piece from Zuda's shop, according to the colors of the Flowers you choose and your personal specifications. TO VISIT MAGDALENE JEWELS' SHOP ON ETSY, YOU CAN CLICK THE PICTURES ABOVE OR, IF YOU'D RATHER, CLICK RIGHT HERE! Those necklaces are just beautiful and perfect for spring! May day must be a lovely day to have been born on. Nice, Happy B.Day for the 1st :) T.
The necklaces are beautiful and perfect for springtime. I love the way you worked my two necklace's into the beauty of Nature and Spring. Perhaps someone you love will present you with one for your birthday! Although not part of my religion - I have always found MayDay to be exciting and special - you forgot to mention the May Pole Dance! we used to do that early in the morning on May 1st. Thanks for your beautiful blog! 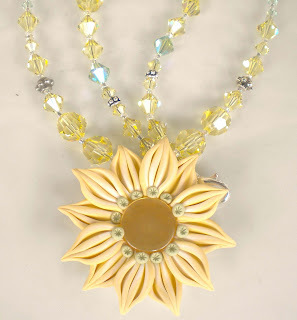 Springtime is amazing and these necklaces are just beautiful! Stopping by from SITS to say Hi and Happy Saturday! A beutiful post,best wishes to you for a wonderful year. if i dont say so then, a happy birthday for the first of may! Wow!!! those flowers are beautiful, love your work of art.